This year, Myer has reimagined Santaland to create the ultimate, Christmas adventure: an in-store, immersive experience and recreation of a magical, winter-wonderland. 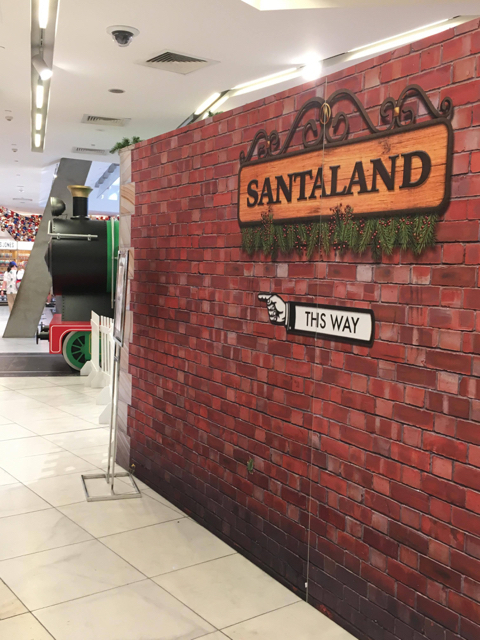 The key showpiece of the in-store experience is the Santaland Express – a life-size train that will whisk shoppers of all ages away on a virtual journey from Myer Central Station to the North Pole. Kate's little ones especially loved having snow balls thrown at them! Once in the North Pole, you can meet and have your photo with Santa, enjoy Santa’s workshop with various interactive Christmas themed play stations including Lego and Duplo, Nerf Gun target shooting and of course letter writing for kids (and adults) to send Santa their wish-lists! Book your session(s)/visit(s) online to avoid the queues. Don't miss out on Storytime with the wonderful Mrs Claus too! Your little ones will love reading the Myer Christmas storybook, The Completely & Utterly, Absolutely Perfect Christmas. Kate's little ones also loved posing for photos & giving cuddles to the Large Scale Christmas Characters. The Christmas Giftorium is also great to visit while you're at Myer. The Christmas Giftorium is Australia’s number one destination for all your gift giving needs and is famous for its personalisation. An exciting new addition to Myer this year is personalised Tim Tams. Of course, don't miss the Myer Christmas windows while you're there! Thank you Kate for your photos and review on Santaland. To follow Kate's adventures with her little ones across Melbourne, head to their Instagram account. For more information on Myer Santaland and more, head to their website. For more ideas on Christmas activities and events in Melbourne, head to our special Christmas 2017 post.